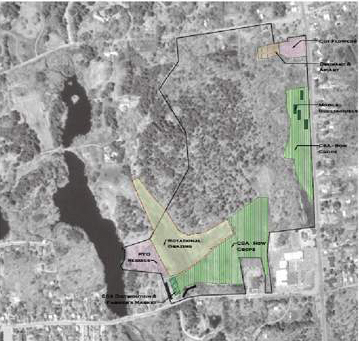 In 2008, the 4th generation owners of Langwater Farm in Massachusetts decided to preserve eighty acres of their prime agricultural open land—the historic core of a peri-urban area. A long term revitalization of this prime natural resource was their goal. By accessing Land For Good ag-savvy technical assistance, the Ames family extended the extensive in-house expertise they already had. LFG staff and consultants developed and presented a range of potential land uses for the 40 acres of hayfields with the objective of establishing a sustainable leasehold for an experienced farmer that would fulfill the owners goal. LFG recruited candidates, made recommendations, and drafted a 5 year agricultural lease. The process went well, and in October, 2009 a lease was signed with Stone Soup LLC, an experienced farm family team taking over operations and implementing a farm business plan that will fulfill both the farmers and owners’ needs. Read more about Stone Soup Farmers at Langwater Farm.